Following the company's second quarter earnings report, analysts issued their usual investors notes on Activision Blizzard. One comment that raised some eyebrows came from Ben Schachter of Macquarie Securities, who said "we have significant concerns that CoD may have peaked in 2011." Michael Pachter of Wedbush Securities largely agrees with Schachter's assessment. "Annual sales at the 25 million level are unprecedented, so it's easy to say 'that's the peak.' I think that the growth in online multiplayer fueled CoD sales, since it was (and probably still is) the best multiplayer experience available. However, last year, Battlefield multiplayer probably cannibalized it a little bit, and this year, Halo and Medal of Honor could cannibalize CoD a bit more. Next year, another Battlefield plus the Respawn and Bungie games probably cannibalize it a bit more," he said. That said, even if CoD doesn't show growth, it's bound to post massive sales again. "There's nothing wrong with 22 million units sold, or with 19 million or 16 million. CoD will remain the best selling game (at least until GTA) and Activision shouldn't be concerned if it loses some players at the margin. They created a phenomenon, and others are emulating them," Pachter continued. "It may very well have peaked at retail but one needs to look at the entire picture"
Colin Sebastian of RW Baird believes that CoD may have peaked already too. "Activision has provided financial guidance assuming that Call of Duty is lower this year than last year, so I think that is a rational comment, especially given the tough console market right now," he said. "Also, if new consoles are coming next year, that is typically a disruptive period for game sales, and that could drive sales lower as well, at least temporarily. The bigger question I think is whether the franchise (or any franchise) is in a continuous period of decline. Personally, I don't know which competing console title would take so much share from Call of Duty." Of course, these days, thinking about a product's retail life is not the only way to measure success. Call of Duty lives in an online world, and with Elite, and the expansion to China via Tencent, it could be argued that the brand's potential hasn't peaked at all. 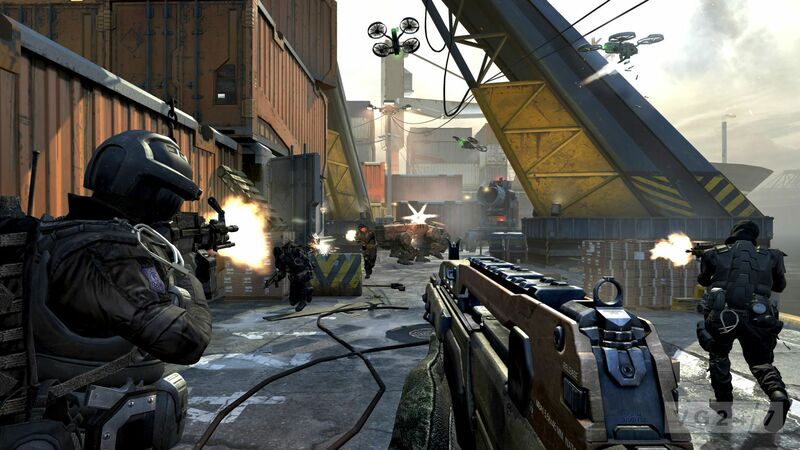 "With the movement to digital and opening of new markets like China there will be an entirely new source of revenue for Call of Duty that will both replace some of whatever is lost at retail and also not be tracked in retail sales data," remarked Jeremy Miller of DFC Intelligence. "We feel that Call of Duty is a very strong brand and has plenty of ways to monetize. Tracking retail unit sales year over year is not really a fair comparison as they could be down but overall revenues might be up. So it may very well have peaked at retail but one needs to look at the entire picture. In that sense we do not feel Call of Duty has peaked." Scott Steinberg, CEO of TechSavvy Global, agrees that retail sales can't be used as the sole barometer for Call of Duty anymore. "While temporary signs of concern may exist, and some attrition may be experienced this holiday season in keeping with the dampening of retail uptake and shifts in consumer habit, it's far too early to determine the extent or degree to which the Call of Duty franchise has peaked. Ancillary products and services should continue to be introduced over the coming years, and additional ventures explored in the online, digital and service-based realms, including possible expansion onto added devices and formats. Which is to say that while sales of physical product for PC and console may not reach the dizzying heights previously attained, the franchise continues to offer many possiblilities for growth and expansion, and remains one of the strongest IPs in the gaming space," he observed. "It's likely to take some shots this holiday season, but none should prove lethal: A grizzled veteran of the gaming space, it remains one of the sturdiest warriors in the industry and - whether it suffers glancing wounds or no - may yet sound a rousing call to arms in coming years. The big question here - to what extent will a dip in retail sales, by far the franchise's bread and butter, affect the future shape and direction of the franchise. While it may be fighting a losing battle for the immediate and foreseeable future on one front, it may yet win the war." Well if u dont improve gameplay and same sort of gameplay comes over and over again in each game of the series it will definitely peak and people will become eventually tired of it. That one year it will sell less, that's a given. But if it does decline this year, it still will sell a shed load. I can't imagine a decline so sharp within the generation that Activision won't have a chance to launch something else. The question then is once it enters a decline, what will Activision's replacement be? Activision may be having success focusing on a few core brands, but they will need something else, that seems to be the gamble in the strategy. when the new hardware comes, something new may be given a shot at the crown. If only Activsion had bought the publishing rights to the next product from a developer whose game defined an entire console platform. Genre fatigue never stopped Hollywood. Even if 'Americans patriotically shooting guns' gets out of fashion (which I find highly unlikely), something will replace it and Activsion will produce it. Even if it has to be "Ban Ki-moon's Peace Treaty Negotiation Simulator 2015" for Kinect. OK I know this is childish, but Pachter and Schachter? What are the chances...? It's gonna have competition from Halo 4 this year at least on the xbox which is released 2 or so weeks earlier. It will be interesting to see if xbox users buy it on release or wait for halo fatigue before they get it. I dont see MoH Warfighter giving it sales competition as its being released a month earlier. As wallets get squeezed tighter it will be intertesting to see if people want something new or will stick to the tired, tried and tested CoD. I for one wont be getting it and neither are my usual suspects of friends whom I game with. I'm sure we had a thread on GamesIndustry.biz predicting this about two or three years ago? It was around the time when everyone left Infinity Ward. Personally I lost interest after the first Modern Warfare. This is what an analyst has said, right? As in a professional who gets paid money? If that's the case, I could have told people this for free a few years ago. Even if it has to be "Ban Ki-moon's Peace Treaty Negotiation Simulator 2015" for Kinect. Being that game consoles are banned in China and the fact that computer gaming...in particular, addictive first person shooters...are a thorn in the side of the various ministries, Activision will have a tough time extracting real value out of the China. Although they have a distribution agreement in place for their online game, that's the first step in extracting value out of the country. Their sustained success will be hinged upon successfully managing the various ministries. Although they will still get imports from Hong Kong, Taiwan, and other neighboring markets, it still severely limits the available market for these platforms in China. Also, good luck with getting incremental legitimate PC platform sales in China. My personal opinion is that the new CoD will be a tough sell with core consumers as a result of the storyline shift to the future. It opens the franchise up to too many comparisons across numerous competing franchises. The core gamers of the genre I know and play with aren't too happy with its evolution. Should be interesting in November...let's hope that it performs well as it's success will have industry-wide implications. I'm surprised no one mentions the world is generally a bit more peaceful at the moment. The last ten /eleven years has been quite volatile in terms of world politics and conflict. That feeds in to games of this nature and the popular mindset. I'm sure if that changes they will see more interest in "getting the bad guys" again. For now the bad guys are in banking, and that's pretty boring. I'm tired of all these futuristic settings too, why can't the next Call of Duty take place somewhere new like World War 2?